The exterior of this bowl has many shades of outside has shades of yellows, from light to dark it has them all. The interior and collar also have shades of red and many more. 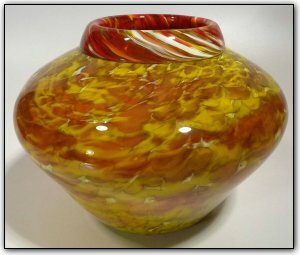 To help the colors stand out and to make them even more deep and intense, a technique was used to put very thin layer of white beneath the interior and exterior colors, making the colors just about jump out of the glass!